Apologies for this late Forgiveness Friday post! The holiday weekend took over and I just couldn’t catch up! How was your weekend? Fireworks? BBQ? Scorching weather? Well this week we’re in for a treat. I got a question that I think goes perfectly with the next step in how I think we should all approach this forgiveness thing. So let’s get to it! We began the process of opening up ourselves to the POSSIBILITY of forgiving. After exploring what forgiveness actually is we explored why it’s important (“For if ye forgive men their trespasses, your heavenly Father will also forgive you”. – Matthew 6:14) and asked God to help make us aware of relationships we need to apply forgiveness to. Let me know how you applied last weeks post to your life. I love to read about how God is moving in our lives! I have been dealing with the challenge of forgiveness for such a long time. Growing up as the youngest child and grandchild of the family has been challenging for me. Actually, I just came to the realization that I have felt “unaccepted” by some of my older family members, all these years. I don’t really know how to start the conversation when they are so opinionated and unwilling to listen (at times). Often times I feel as if my words and feelings go in one ear and out the other. How would you suggest I approach the situation? First I’d like to thank the reader for submitting the question and being so open and honest about their experience. The conversation we must have when it comes to setting ourselves free is important and should not be taken lightly. A conversation requires two willing participants, and when one party is unwilling it’s difficult and sometimes impossible to form a consensus. I think it’s particularly difficult to address issues from our childhood’s while trying to reach out to the generations before us. For example, my family is from Mississippi. My elders grew up hard…the women in my family were maids and the men worked in the cotton fields. The whole “self-help” thing was and still is not understood. There’s a “get over it” type of attitude, which breeds years and years of resentment, pain, and regret. Seeking counseling is still a taboo in the African-American community, which explains the rampant unforgiving cycle we’ve all probably experienced. Anywho, getting back to answering this question. You can only do what you can do. Sometimes we have to set ourselves free. Going into this understanding that you may not receive the closure you’re looking for or expecting is important. More importantly is knowing that we can still move on and live a life free of pain and resentment if we allow Jesus to be the source of our joy and peace. Now that we’ve addressed our expectations let’s get into THE CONVERSATION. The Lord sent me this word through the Pastor of the church I’ve been attending. Pastor Darius Daniels is the pastor at Kingdom Church and I felt the Lord speaking to me last weekend when I listened to his sermon on Caring Confrontation. Matthew 5:23-24 “Therefore if thou bring thy gift to the altar, and there rememberest that thy brother hath ought against thee; 25: Leave there they gift before the altar, and go thy way; first be reconciled to thy brother, and then come and offer thy gift”. Yes, I read from the KJV, lol. Basically, the Lord tells us not to come to him offering anything until we’ve tried to work things out with those who we have unfinished business with. This means you may not feel that you’ve done anything wrong. YUP, God wants us to go and start that conversation. And if we feel we’ve been wronged, that conversation needs to happen too. Pastor Daniels explains the importance of conflict resolution: “When we try to resolve conflict without Biblical application we find ourselves making it worse”. WHOO, I am a witness. Confrontation without Biblical application can be MESSY. You might end up cussin’ somebody out or coming to blows! Speaking from experience. LOL! So let’s not do that. Here’s how we can apply “Caring Confrontation”, as Pastor Daniels put it, to our approach on this forgiveness journey. The Bible tells us to be angry but not sin. In other words we aren’t expected to be emotionless, but we should not transfer that anger into sin (the cussing out I spoke of before). Stop mismanaging your anger. Until you empty your heart of offense, God can’t bless you like He wants to! Forgive and get things right before coming to Jesus. Again, I am a witness! I was blessed 10 times over after clearing my heart of pain and unforgiveness! Carrying all that around I was unable to take on the new car, the new job or anything else God wanted to bless me with. Just because it’s offered does not mean it’s accepted. Take heed > You have to love yourself in order to forgive others. 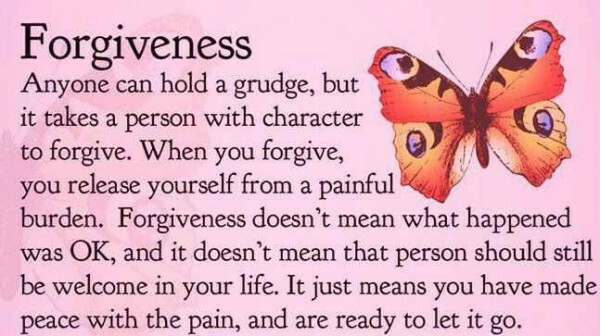 Simply because forgiveness is FOR YOU! Forgiveness relieves your heart of the acidity of offense. This is about obedience. You’re obligated to put forth an effort to reconcile. Obey and get out of God’s way. Speak the truth in love! For example, you know when a boo does something stupid, y’all talk it out and you forgive him. Going to cousin Nae Nae or Pookie and telling them allll about it is NOT OKAY. God sees our gossip about others as sin, and puts us in the same boat as the person who did wrong (the boo). 1. Understand that it’s your obligation. Refer back to Matt. 5:23-24. 2. Understand that the conversation will give you a revelation of who you are dealing with. YEP. A forgiveness conversation is a great way to really SEE the person you’ve hurt or the person who has hurt you. Do they insist on holding onto the past? Are they open to rekindling or redefining the relationship/friendship? Do they make excuses for making you feel the way they did? Do they accept responsibility? 4. Listen to the answers, they reveal character. If you interject too much, you’ll overpower the critical responses and miss the chance to observe what the person is showing you about who they are. 5. Ignore the excuses and/or ask directly. Stay on point! PHEW this is a hard one. It’s common to hear a person make the issue about something unrelated to the matter at hand. In order to gain clarity and get free, stay on point and avoid those distractions. 6. Explain what’s next and cover them (don’t expose their faults, i.e. gossip). I know….cover what? When someone has done you wrong the first thing that comes to mind is, “I’m about to let everyone know about this triflin’, etc, etc.” Stop it. Just stop. Like I said above: God sees our gossip about others as sin, and puts us in the same boat as the person who did wrong. Keep private matters private. It will pay off in the end, promise! 7. Move them around in your life according to the answers and information from the conversations. The result should not be whether or not they saw your point of view or whether or not you two rekindle the relationship. It’s all about the information you observed after the conversation you had. After you’ve done more listening than talking you can adjustment the type of relationship you’d like to have with someone. We’ve got some work to do, yes? Now that we’ve asked the Lord to prepare our hearts let’s ask him for the courage it takes to take the next step. Remember we need to clean things up with people who feel they’ve been hurt by us! In addition making the effort to speak with someone who has hurt us or who needs our forgiveness. Lord give us the courage to start the conversation, wisdom to approach the conversation by your principles and strength to accept the outcome. We thank you for your grace and mercy and pray you comfort us as we clean up those places that we’ve refused to look at for so long. AMEN! Be blessed loves! Again, please let me know your thoughts below in the comment section and ASK ME ANYTHING below or at thekglifestyle@gmail.com. I would love to hear from you and answer your questions in next week’s post!